that I might bring it back and count it. When I ended my last post with the thought that "the observer (me) must choose a place to stand to take the measure of the falcon-headed god," little did I know that the chief symbol of Horus itself is a measuring tool. 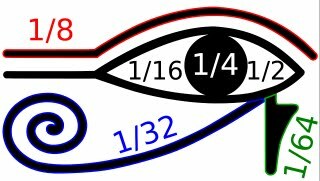 The six individual shapes that comprise the eye of Horus are the signs used by the ancient Egyptians for fractional portions -- 1/2, 1/4, 1/8, 1/16, 1/32, and 1/64 -- of the hekat, a standard unit of grain or flour. What does the eye of Horus have to do with a unit of measure? The eye plays a central part in the story of how Horus ruthlessly fought against his uncle, Set (or Seth), who had killed Horus' father, Osiris. Horus bore qualities amalgamated from his identity as the sky god, his right eye representing the sun and his left eye, the moon. Seth ripped out Horus' left eye and tore it into six pieces. Thoth, the god of mathematics and the moon (which also appears to shrink and grow by fractions each month), magically restored Horus' eye, and the chief gods granted Horus kingship over a united Egypt. The role of the sound eye of Horus as a symbol of healing and wholeness was reinforced by another myth in which Horus brings the restored eye to his father, Osiris, who consumes it as an offering meal and is regenerated. The Horus eye appears frequently on tombs and temples as a protective sign and offering. Tutankhamen's mummy was found to bear a gold, lapis lazuli, and glass eye of Horus amulet, which the pharaoh may have worn in real life. The resemblance of the healing eye of Horus, with its fractional component shapes, to the form of the letter R is given by some as an explanation for how the Rx sign came to be associated with prescriptions from Roman times until the present day. Even more interesting is the suggestion that the Egyptians may have recognized that the geometric series 1/2 + 1/4 + 1/8 ... converges toward but never reaches unity, thus bridging the finite world of weights and measures with the infinite world of the gods and strengthening the role of the eye of Horus as a symbol of order. Hymn of Thoth from the Coffin Texts, III, 343, as cited in Rundle Clark, R.T. (1959). Myth and symbol in ancient Egypt. (London: Thames and Hudson), p. 225. Horus eye fraction image by Benoît Stella licensed under the Creative Commons Attribution ShareAlike license versions 2.5.